Printer is an essential device for a commercial company. Documents like MS office, PDF, images, CAD designs, etc. are often printed. It's also possible that someone uses a printer to print confidential documents. To prevent any data leakage via printers, printer monitoring is necessary. One of the functions in SurveilStar monitoring software you like may be printing logs. SurveilStar can record any printer usage including printer type, time, computer, group, user, printing task, printer name, pages, caption and application. And surveilstar printer monitoring software supports all kinds of printers including local printer, shared printer, network printer and virtual printer. Select a computer or a group at first, then specify your search conditions including time and range, printer type, printer name, connected PC, task, pages, application and has backup. Printer Type: Supported printer types include local printer, shared printer, network printer and virtual printer such as Adobe PDF Converter. Printer: Enter name of the printer to search. Wild-card(*) is not accepted. Connected PC: It refers to the PC where the printer is connected. If it's a local printer, then PC itself is the connected PC. If it's a shared printer, then the remote computer with printer shared is the connected PC, ususally you can enter IP address. Task: Enter file name of the printed documents to search. Wild-card(*) is accepted. Pages: Specify printing page to search. You can check if there is any printing abuse. Application: Specify printing application to search. Many applications allow users to print and here you can search the printing logs from your specific applications. Click ... button to open the setting dialog. The settings are same as what is explained in former chapter of Application Logs. Has Backup: In printing policy, you can enable recording printed contents. Once printing recording is enabled, there will a backup copy for any printed documents. In printing logs, the printed files which has a backup copy will be displayed sightly different. Below is an example of files printed by a virtual printer. After specifying your search conditions, click Search button to view the result. Below is a search result example of printing logs. Right-click on a printing log and click Property to view detailed information including Time, Computer, User, Printer, Connected PC, Task, Paper Size, Orientation, Pages, Recorded Pages, Application and Window Title. 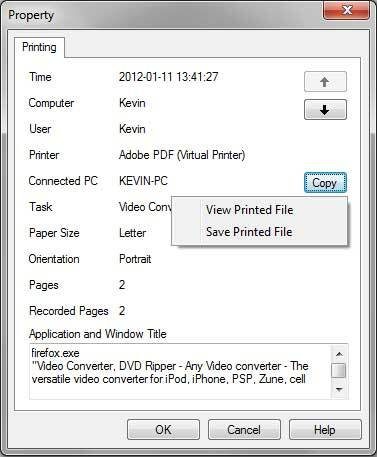 Below is an example of printing Any Video Converter homapage to PDF with Adobe PDF Converter's virtual printer. Please note that this printing task has a backup copy. You can click copy button to view printed file or save printed file. View Printed File: Click View Printed File to open printing viewer. You can zoom in or zoom out, view slide one by one, and save the picture in the viewer as JPG file. Save Printed File: The printed files are saved as JPG files. Every page will be saved as a JPG picture. So there will be multiple JPG pictures when there are multiple pages in the printed task.